The Doll Sweet Journal. : Hershey Park--The Rides! The Fun! This year we we decided to spend a couple of days, including the 4th of July, in Hershey, Pennsylvania for a nice little break on our drive from Iowa to Massachusetts. Hershey is a very sweet place for us (no pun intended). It was the last place we took a vacation together with just the two of us before we had kids. We knew when we went ten years ago that we'd definitely want to come back someday with our kids. And ten years later, we did! It was good for all of us to have a break from long hours driving in the car. Hershey Park is a huge amusement park with hundreds of rides, a waterpark, and a zoo, all nestled in the beautiful rolling green hills of western Pennsylvania. It's such a fun place! We spent two days in the park and still didn't do all of the things we could have done. First ride was the Scrambler! I don't like hot-air balloons and I'll never go on a real one, but they're okay when they're tethered to a machine. Sam and I on a ride together. Look at how calm, cool, and collected we are. I like sky-rides but they make me nervous, especially with kids. A person could just slip out or jump out of one of them pretty easily! The birds' eye view is fun though. Just don't fall or jump. Peter and John in front of us. I spotted the swings from the sky-ride. Peter and I went on these when we were here ten years ago, and they made me so nauseous! It was surprising because I'd never had a problem with any kind of rides before. It was the first indication that I wasn't going to be able to go on circular rotating rides like that anymore as I got older. They weren't a problem when I was younger, but they make me so sick now. Needless to say, my derriere was not found in any of those swings this time around. John on the pirate ship. The boys on the kiddie pirate ship, which was perfect for Sam and less thrilling for John, but still fun. The Cocoa Cruiser was a fun kid roller coaster that adults could go on too (so we did). Playing around while waiting in line. Sam went on the kiddie train ride twice. No surprise there! Riding at the very back in the caboose. It's more fun back there! Hershey Park has a lot of roller coasters. John wanted to ride each and every one of them, but he wasn't tall enough to do that. He rode the ones that he could and he loved them. He doesn't get scared or nervous or anything. We definitely have a future thrill-seeker on our hands. Twisty roller coasters are so cool and fun to photograph! I'll wait to go on this one until John's big enough to go on it with me! The old-fashioned wooden roller coasters are my favorites. My very favorite ride in all of Hershey Park is the Lightning Racer, where two long cars of riders race going around the coaster at the same time, and whichever one crosses the finish line first at the end of the ride wins. So fun! You can see in the picture below the cars crossing the finish line. One side is called "Lightning" and the other is "Thunder." When John and I rode it we were on Lightning and it won. Yeah!! 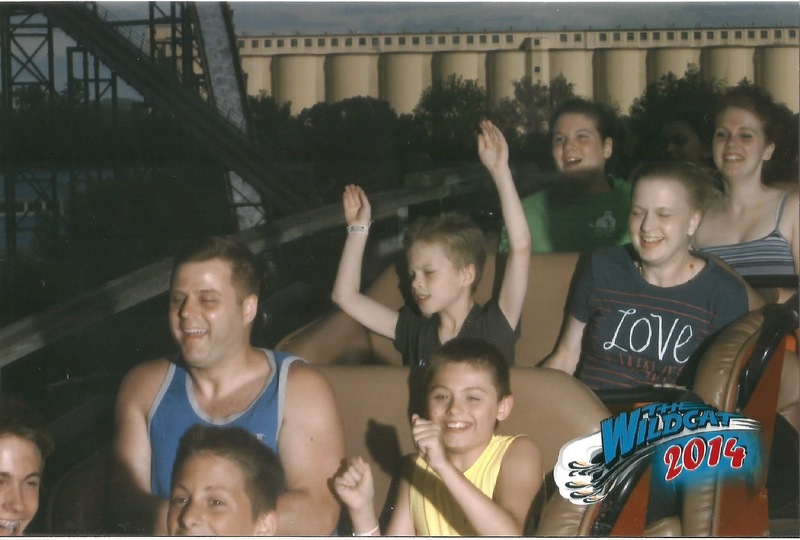 All of the roller coasters take really flattering pictures of you while you're on the ride. Sam's favorite ride was the Ferris Wheel. It provided awesome views of the park and the surrounding area. So bucolic yet so close to the thrills of the park! John went on this crazy ride called "The Claw." This was the ride that I saw the most people shying away from, but he really wanted to go on it and he was tall enough, so I let him. It rotated around and around as it swung up really high from side to side. He liked it and had no problem with it. I, on the other hand, would never be able to go on this ride without getting completely and totally sick, probably even in my younger days! Look how cool and confident he is before the ride begins! It went up really high and swung to other side just as high, all while rotating around. Barf! One of my favorite rides in any amusement park is always the log flume. John and I rode it together and we went on it again later with Peter and Sam. My handsome boy is growing up. I think he's going to be a good-looking teenager! John was thrilled that he got to drive this car! We went on this ride in the evening which is why the picture is dark. There's a beautiful, huge old-fashioned carousel right near the entrance to the park. 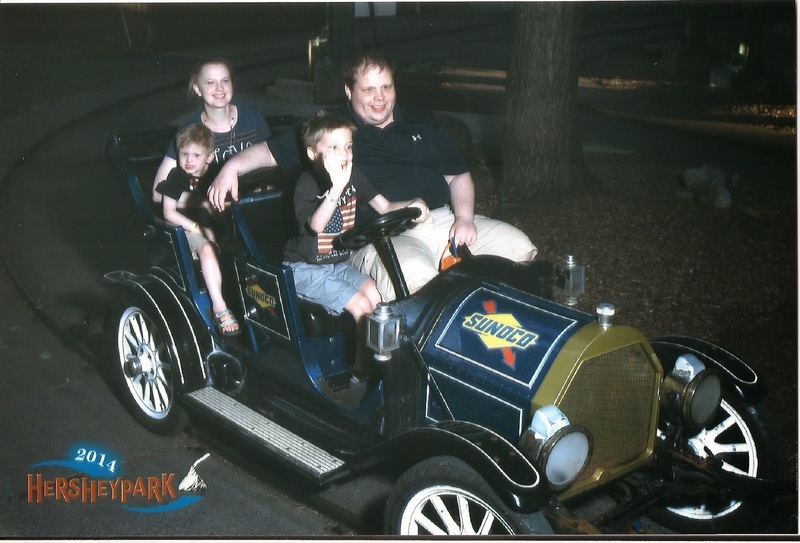 It was the last ride we went on before heading out to see the fireworks on the 4th of July. It was all so much fun. We definitely plan on returning in the years to come!